Fly Angler's OnLine "Intermediate Fly Tying Part 39"
It's time to regress for a moment and cover a couple of simple bass flies we haven't addressed so far. You needed a slack week anyway, didn't you? I'm guessing the flies we will tie this week will be so simple you'll wonder why I even covered them. If that's the case, I'll answer it right now. 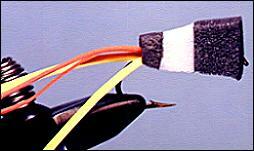 Poppers are productive bass patterns that are very popular. It would be something akin to sinful if I passed them by without looking at them a little. 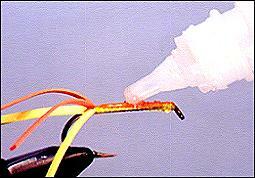 I'd guess about 99 percent of bass fishermen have used poppers at some time in their fishing careers. I'd also guess that 99 percent of those fishermen caught fish on poppers. If they used small poppers, they probably caught panfish as well as bass. If they used real big poppers, they may have caught pike or muskies as well as bass. What some folks don't realize is how well poppers work in saltwater. I don't claim to be an accomplished saltwater angler. In fact, you can count the days I've spent flyfishing in saltwater on the fingers of one hand and have several fingers left over. The reason I know saltwater fish sometimes go for poppers is because I occasionally watch some of those Saturday morning fly-fishing shows on TV. On several shows, I've had the opportunity to watch saltwater anglers catching fish with large poppers. Watching small sharks and barracuda slam a popper was enough to convince me of the versatility of this common fly. Did I say versatile? Well, yes I did. Any fly that catches such a wide variety of fish in such a wide variety of places has earned the title of versatile. The secret to the popper's success lies in the sound it makes when tugged through the water. Depending on the shape of the body, it makes a variation of sounds, but always includes a popping type of sound. That popping sound closely imitates the sound of minnows or baitfish trying to escape a predator. Such a sound can lure predator fish long distances to the source of the sound. That makes this an ideal fly for murky water. It's also pretty good in clear water. Let's tie a couple and you can try them out for yourself. Hook: Any streamer hook with a straight eye. Size to fit the body you want to use, or size the body to fit the hook. 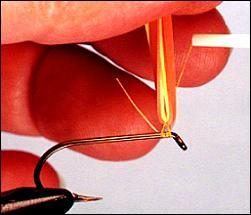 Traditional popper hooks have a hump to keep the body from turning on the hook. Thread: Red, olive, yellow, brown or black 3/0 monocord. 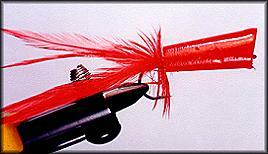 Tail: A mix of four dyed red hackle and white bucktail. Depending on the color you paint the body, this list will vary. It's your choice, but the tail is tied the same as a deer hair bug or diver tail. Body: Angler's Choice pre-formed balsa popper body. Cork and foam bodies can also be used. Angler's Choice balsa bodies have a cup shaped front to make a distinct "pop" that is louder than standard bodies produce. 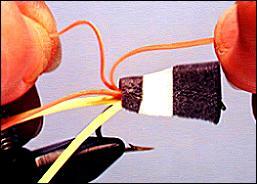 1.If you're using a hook with a hump in it, epoxy the body in place. 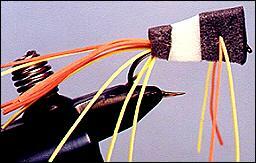 If you're using a plain hook, coat the hook with thread first, then epoxy the body in place. Pay particular attention to how the body is positioned so it rides upright. 2. Paint the body any color you like with lacquer, enamel or epoxy paint. I usually dip the body in paint to get an even consistency. 3. 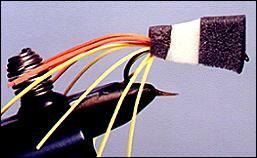 Tie a thin inner tail of bucktail. I used white, but other colors will work too. 4. Add the feather tails, curvature facing out. 5. 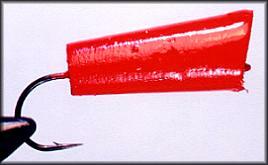 Wrap a hackle (curvature facing back) behind the balsa body. Whip finish and cement when you're finished. 6. Paint or glue eyes on the body if desired. That was too easy. You can use any pre-formed head and any tail combination you wish to tie a popper and these steps will remain basically the same. Do you want to try another one? Let's do it. 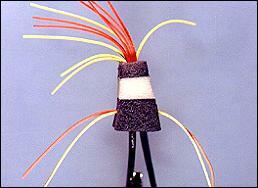 Tail: A mix of several colors of rubber hackle. 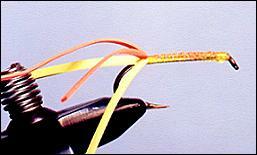 Again, you can use any of the tails we've tied for bass bugs. Body: In this case, I'm using two-color closed cell foam that's commonly used for insulation and waterproofing around ceiling vents on your home, but any closed cell foam will work. Those foam thongs used for showering and the beach make great foam popper bodies. Just cut the body to any shape you like with a razorblade. Then slit the foam on the bottom to make room for the hook. 1. Cut a body of closed cell foam to any size and shape you want. 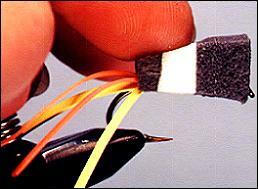 Slit the bottom with a razorblade right up the center to a depth that will accommodate the hook. 2. Select six to ten strands of colored rubber hackle (twice as long as you want the tail to be) and tie them to the hook with two loose wraps of thread. I usually don't separate the strands until later. When you have the strands even (this is done by lifting then cinching the thread), cinch the thread and start tying the rubber hackle down to the hook. 3. 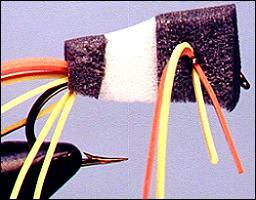 Tie the rubber hackle tail down to the hook to the point where the back of the body will end. 4. Apply a thin coat of Zap-A-Gap to the thread. 5. Slip the foam body down over the thread and pinch the bottom of the body together until the Zap-A-Gap has set. A note of caution is in order here. Zap-A-Gap will glue your fingers to the body or anything else if you get it on your hands. 6. Your popper should now look something like this. 7. Start separating the tail strands. 8. Completely separate all the strands of the tail. 9. 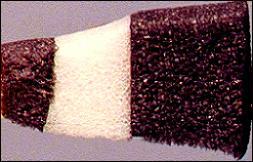 Select several strands of rubber hackle (the same color as the tail) to be used as legs and thread them through a carpet needle. Push the needle through the body. 10. Work the legs through the body until they are even on both sides of the body. If you need to, trim them with your scissors to even the ends. 11. I usually add a drop or two of water based head cement (Angler's Choice thin Soft Body) to the rubber legs to keep them from slipping. Your foam popper should look something like this from the front. You can add color or markings with waterproof markers if desired. If you want a tougher body, you can dip the body in Angler's Choice Soft Body plastic resin before you sew the legs in. This material comes in a thick (red label) or thin (blue label) consistency and is a good substitute for epoxy on some flies. If you decide to add some color or eyes to your popper body, do it before you dip the head. Experiment a little with different shapes and sizes of bodies. You can use any tail material you like and it will still be a popper. If you use light colored foam, you can color the body with markers to look like a frog.